On Wednesday, Speaker Nancy Pelosi (D-CA) sent Donald Trump a letter suggesting that he delay the State of the Union address, or else deliver it from the Oval Office, because the U.S. Secret Service is stretched thin by the government shutdown. This maneuver was about 10% legitimate concern, and about 90% poking Trump in the eye with a sharp stick by bringing negative attention to the shutdown and by denying him a high-profile platform for railing against the Democrats. Anyone who thought Trump would not quickly return serve has not been paying attention for the past three years. On Thursday, he did just that. Due to the Shutdown, I am sorry to inform you that your trip to Brussels, Egypt and Afghanistan has been postponed. In light of the 800,000 great American workers not receiving pay, I am sure you would agree that postponing this public relations event is totally appropriate. It would be better if you were in Washington negotiating with me and joining the Strong Border Security movement [but] if you would like to make your journey flying commercial, that would certainly be your prerogative. Given the odd capitalizations, the letter may actually have been written by the President (or, more likely, by someone who was trying to mimic his writing style). And it is indeed within his power to approve or deny flights in military planes. Undoubtedly, his base will be thrilled that he delivered some payback to the Speaker. However, this round nonetheless goes to the Democrats, since postponing/canceling/relocating the SOTU does more harm to Trump than postponing/canceling a fact-finding trip that nobody even knew was happening. Further, Team Trump helpfully made clear that this was 0% legitimate and 100% poking Pelosi in the eye when, just hours after the letter was sent, First Lady Melania Trump boarded a military plane for a weekend Mar-a-Lago getaway. While Trump was undoubtedly sitting in the Oval Office and rubbing his hands together with glee, the Democrats were staging a stunt of their own. Taking advantage of some parliamentary procedural magick, as well as the (apparent) poor attention span of the House Republican Caucus, the blue team passed a continuing resolution that would reopen the government, and did so by voice vote. By the time the GOP members had figured out what was happening, their Democratic colleagues were headed for the exits, and for their trips back to their districts. The bill has zero chance of becoming law, and would have passed regardless of how it was handled, but by doing it this way the Democrats can claim that it passed the House unanimously and that every one of the 435 members wants Trump to reopen the government. Now, the careful reader will notice that both sides are investing all of their time in theater and in eye-poking, and nobody is doing much of anything to actually resolve the stalemate. Not only that, but by stoking the other side's anger, both Democrats and Republicans are actually making it harder to reach a resolution. Especially given that if there's ever been a president who takes things personally, and is willing to put his own ego and feelings ahead of the well-being of the country, it is Donald J. Trump. Also not helping things is that Trump appears to have completely misread...well, everything. He cannot understand what it is the Democrats want, nor why much of the public supports them. He doesn't think 800,000 federal employees being out of work is a big deal and, perhaps most significantly, he believes that voters will remember he stood firm for his wall long after they forget there was a shutdown. All of this is very self-serving, of course, and does not square with the available evidence at all. In particular, while a brief shutdown may not attract all that much notice, longer shutdowns are among the most visible black marks on a president's or a party's résumé. And this isn't just a long shutdown, it's the longest shutdown in U.S. history, with effects that will continue to pile up, and that will get worse and worse the longer it's allowed to linger. Even if such a thing could possibly fade from voters' memories between now and the year or so when the 2020 campaign begins in earnest, the large and vocal Democratic field will make sure to issue reminders aplenty. Donald Trump's former fixer, Michael Cohen, is scheduled to testify before Congress in February, and then to head to the hoosegow in March. In advance of those two events, however, he made some pretty big headlines on Friday. First, there was a report that Cohen paid John Gauger, the owner of RedFinch Solutions LLC, tens of thousands of dollars to manipulate the results of online polls in Trump's favor. The Wall Street Journal first reported this news on Thursday morning, and later in the day, Cohen confirmed it in a statement, noting that his actions were, "at the direction of and for the sole benefit of Donald J. Trump. I truly regret my blind loyalty to a man who doesn't deserve it." Gauger has also confirmed the story, so while there are a lot of dishonest people involved here, it certainly appears the report is true. That wasn't all, however. Later Thursday, BuzzFeed News reported that Trump ordered Cohen to lie to Congress when testifying before them in May 2017. Specifically, Cohen was told to lie about how long negotiations for Trump Tower Moscow actually lasted, and not to mention his efforts to arrange a Trump business visit to Russia during the campaign. Unlike the WSJ story, Cohen has not confirmed the BuzzFeed story, though he hasn't denied it, either. The outlet's reporting was based on conversations with two federal law enforcement officers who have been investigating Cohen. Hiring someone to manipulate online polls is a bit shady, and also a bit pathetic, but it's hard to see what laws might have been broken. On the other hand, if BuzzFeed's reporting is correct, it would be very bad for Trump. First of all, it would be the first known instance of the President specifically ordering one of his underlings to lie about his interactions with Russia. And if Trump did it once, he presumably would have done it additional times, like maybe in relation to the Trump Tower meeting with Natalia Veselnitskaya. Second, it would mean that Trump's business relationship with the Russians (or, at least, his attempts to build such a relationship) went on far longer than he has claimed. That would not only be a particularly serious lie on his part, it would also mean he had extra motivation to conspire with the Russians while the campaign was underway. And finally, and perhaps most significantly, if Trump actually did order Cohen to lie to Congress, that would be suborning perjury, which is a felony. When AG nominee William Barr testified before Congress, Donald Trump was, of course, watching closely on TV. And according to reporting from CNN, the thing that struck the President the most, and not in a good way, was Barr's telling the committee about his very long and very warm friendship with special counsel Robert Mueller. On Wednesday, Donald Trump's television lawyer Rudy Giuliani did an interview with CNN in which he admitted that members of Donald Trump's campaign might have colluded with the Russians. On Thursday, in a development roughly as easy to predict as the sun rising in the east, Giuliani spent his day trying to convince everyone that, "I know that you believe that you think you understand what you thought you heard me say, but what you don't realize is that what you heard is not what I meant." Ok, those weren't his exact words (they are allegedly Alan Greenspan's). However, they do get at the spirit of Giuliani's efforts to walk back what he said. I represent only President Trump, not the Trump campaign. There was no collusion by President Trump in any way, shape or form. Likewise, I have no knowledge of any collusion by any of the thousands of people who worked on the campaign.The only knowledge I have in this regard is the collusion of the Clinton campaign with Russia which has so far been ignored. In other words: (1) I can't speak for anyone who is not Donald Trump, and (2) What about Hillary? Of course, up until Wednesday night, Giuliani was more than happy to speak on behalf of anyone and everyone who was a member of the Trump campaign, including Paul Manafort and, in case anyone has forgotten, Melania Trump. As to Hillary, there is no evidence that she or her campaign conspired with the Russians, and she is also not the president of the United States, nor does she hold any other public office. Beyond that, however, it is a fair point. In addition, it does Team Trump no good for his (TV) lawyer to effectively admit that there probably was collusion on the part of the campaign, as it completely cuts the "witch hunt" claim off at the knees. And even if there is some benefit that escapes us, it is not useful to give one version of the admission on national TV on Wednesday night, and then to try to replace that with a different wording on Thursday. If this was pre-planned spin, then a precise wording would have been nailed down well before Giuliani sat down for that interview. Well, this is unusual. On January 3, Rep. Tom Marino (R-PA) began his fifth term in the House. Yesterday, just two weeks into that term, he resigned. "Having spent over two decades serving the public," he said in a statement, "I have chosen to take a position in the private sector where I can use both my legal and business experience to create jobs around the nation." For many GOP representatives, including Marino, this is their first taste of life as the minority party. In the House, unlike the Senate, the minority party is largely powerless. Perhaps two weeks of that, with the government shutdown to boot, was enough to persuade Marino that this isn't his cup of tea anymore. Maybe a scandal is about to hit. Marino was in line to be named Donald Trump's drug czar last year, but had to withdraw after scrutiny of a law he sponsored that made it harder for the Drug Enforcement Administration to prosecute opioid manufacturers that are careless about whom they sell to. It's not likely that same issue is in play here, but maybe there's another skeleton in the closet. He may have been nervous about his re-election chances, despite representing a very red district, and might have started putting out feelers for a backup job last year. Maybe that process yielded an offer that was too good to turn down, even though he won reelection. Marino has had health issues in the past, including cancer twice. Perhaps the cancer has returned, or some other problem of this sort has surfaced. Given that the Democrats just managed to beat Sen. Martha McSally (R-AZ) in a non-presidential year (she was then appointed to John McCain's seat), she is one of the Democrats' top targets in 2020. Part of the secret of the blue team's success in 2018 was that they had a strong candidate in then-Rep. and now-Sen. Kyrsten Sinema (D). They want to make sure they have an equally strong candidate in 2020, and they think they've got one in the person of Rep. Ruben Gallego (D-AZ). Gallego's selling points are obvious: He's charismatic, a combat veteran, a Harvard graduate, a Latino, and a progressive. He won't get very many Republican crossover votes, but he should appeal to the groups that are key to the blue team's chances in Arizona in 2020: independents, young voters, and Latinos. He met with Senate Minority Leader Chuck Schumer (D-NY) and DSCC Chair Catherine Cortez Masto (D-NV) on Wednesday to discuss a possible run, and afterward said, "I'm strongly considering it. I'm basically making the final decision and we'll have that in the next couple weeks." This week, we veer leftward, geographically and politically. Background: Nobody will ever accuse Inslee of being a carpetbagger. A fifth-generation Washingtonian, his family first came to the state...well, before it was a state. His mother was a clerk at Sears and his father was a well-known high school counselor and coach. Graduating high school at the height of the Vietnam War, he got student deferments from the draft, and spent a year at Stanford before dropping out for want of money. Returning home, he took his BA in economics at the University of Washington, and then his JD at Willamette University School of Law. He practiced law for a decade, first becoming interested in politics in 1985 due to his involvement in efforts to build a new high school. Political Experience: Not long after the new high school was funded, Inslee ran for the state legislature and won, serving two terms (1989-93). That was followed by a term in the U.S. House of Representatives (1993-95), but he was washed away in the 1994 GOP "Contract with America" wave. He ran for governor of Washington in 1996, lost, and then went to work in Bill Clinton's Dept. of Health and Human Services. Inslee was returned to the House two years later, and served an additional six-plus terms (1999-2012). He left in the midst of term seven to run successfully for governor of Washington, and won reelection in 2017, meaning he's currently serving his second term. Washington does not have term limits, so there's no particular pressure on Inslee to find a new job by 2021. Signature Issue(s): Inslee's State of the State address was this week, and it was pretty much a "greatest hits" of progressive ideas, including healthcare reform, restrictions on guns, greater protection for workers, more regulation for corporations, and free or reduced-cost college for students. However, he has made very clear that the issue that he would build his hypothetical presidential campaign around is global warming. During his time in both Congress and in the Washington governor's mansion, he's built an extensive pro-environment record, and has even written a book on the subject, entitled Apollo's Fire: Igniting America's Clean Energy Economy. Instructive Quotes: Inslee is known for his unique way of expressing himself, à la Yogi Berra. For example: "We've got the most precious environment in the history of the solar system," or "I've embraced moving forward so that everybody can move forward together," or "I'm pretty sensitive to small businesses. I was one." Completely Trivial Fact: Most politicians are not known for their athletic prowess, but Inslee led his high school basketball team to a state championships, and has also played in games with Barack Obama where his team won and Obama's...didn't. 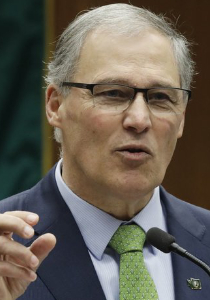 Recent News: Having delivered a state of the state speech this week that reads like a 2020 campaign platform, Inslee will visit New Hampshire later this month. He may not receive a warm reception from party activists there; while chair of the Democratic Governors Association last year, he decided not to send money to Molly Kelly, who lost a fairly narrow race to Gov. Chris Sununu (R). Quite a few of the Granite State's Democrats blame Inslee for the defeat. Three Biggest Pros: (1) As someone who has represented a deep blue state and a deep blue Congressional district, he doesn't have much in the way of not-so-progressive items on his record, unlike most of the other 2020 progressive candidates; (2) Nearly all of the Democrats' 2020 candidates have done their best to condemn Donald Trump and to frustrate his policies, but Inslee might have done the most to be an obstacle (particularly as regards the Muslim travel bans), as he has a staunchly Democratic legislature and state AG at his disposal; and (3) There will be a presidential campaign at some point where Democratic voters want global warming to be the Party's main issue; if that campaign happens to be 2020, then Inslee will have a huge leg up on the competition. Three Biggest Cons: (1) As a white guy, he might not excite the Obama coalition (particularly young and minority voters), and as a staunch leftist, he might not excite the Bill Clinton coalition (particularly centrists, white ethnics, and labor)—if he fails to connect with both, that's a real problem; (2) What swing states can he plausibly put into play? Certainly not Texas, Florida, Pennsylvania, Michigan, or North Carolina; and (3) Malapropisms are charming from a local or state politician, perhaps, or a cantankerous 20-term member of Congress, but on the big stage they make a candidate look amateurish and not up to the job. Think Dan Quayle. Is He Actually Running? : He's forming an exploratory committee this month, and says he will make his decision by the time the current session of the Washington legislature comes to an end. That would mean a deadline of April 29. Betting Odds: The bookies are not, at present, offering odds on Inslee, which means that bettors see him as less probable than Lady Gaga, Neil deGrasse Tyson, George Clooney, and the not-actually-eligible-to-serve Rep. Alexandria Ocasio-Cortez (D-NY), among others. The Bottom Line: Inslee realizes his odds are long, but says that his models are Jimmy Carter and Bill Clinton—that is, governors of smaller states that came from nowhere to win the White House. The problem is that Carter's approach (catch people by surprise by winning in the early primary states) has not worked since he used it, and is unlikely to work this year given that California has moved its primary up. Meanwhile, Clinton benefited from the fact that the successful Persian Gulf War cleared out most of the Democratic field, while the recession that came thereafter cut George H. W. Bush off at the knees. In other words, neither of those "models" actually has any relevance this year, unless Donald Trump somehow adds 50 points to his approval rating in the next few months and scares off most of the Democratic field. Failing that, the lane that Inslee would occupy is already jam-packed with candidates, many of them better known and with more money in the bank (Sens. Elizabeth Warren, D-MA, Bernie Sanders, I-VT, Kirsten Gillibrand, D-NY, Kamala Harris, D-CA, etc.). He also doesn't offer much as a VP candidate. In short, the exploration that he's doing in the next couple of months is not likely to yield good news, and he's more likely to announce a third gubernatorial bid than a presidential bid.